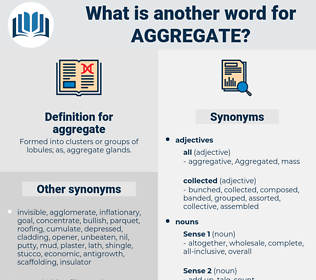 What is another word for aggregate? Cumulated, accumulate, accrued, all-encompassing, accumulative, macroeconomic, over-all, totals, macro-economic, flat-rate, recapitulative, grouped. integrates, gathers, consolidates, unites, regroups, comprises, collects, appends, encompasses, consists, includes, combines. portion, single, squander, parcel, waste, net, spend, distributive. dissipate, divide, separate, disperse, break up, disconnect, scatter, detach.
" I assure you, my dear Julia, that, though in the aggregate they are somewhat inconsiderate of the feelings of naval officers, they are individually as amiable gentlemen and affectionate husbands as any other men," said Jack. In the aggregate these amount to a considerable blessing. accurst, acaricide, accursed, Aggregated, akaryocyte, acaracide. commix, unify, mingle, amalgamate, mix.